Bring the classic taste of the baseball stadium to your house with my tasty pretzel recipe! They are ultimately tender, buttery, and sprinkled with just the right amount of saltiness. They are easy to make and are perfect with spicy mustard or zesty cheese sauce! 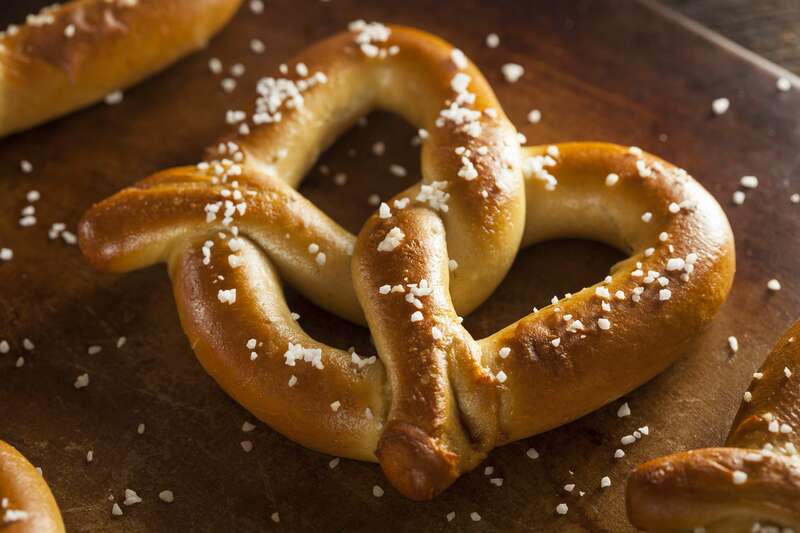 RecipeSavants.com Bring the classic taste of the baseball stadium to your house with my tasty pretzel recipe! They are ultimately tender, buttery, and sprinkled with just the right amount of saltiness. They are easy to make and are perfect with spicy mustard or zesty cheese sauce! Smart Recipes, European Recipes, Dairy,Eggs,Grains Recipes, Recipes Dairy,Eggs,Grains European Ballpark Style Soft Pretzels PT30M Serves 6 Ingredients: 2.25 Teaspoon Active Dry Yeast 1 Cup Warm Milk 2 Tablespoons Honey 2 Tablespoons Unsalted Butter 1 Teaspoon Salt 2.25 Cups Bread Flour 3 Tablespoons Baking Soda 1 Large Egg 0.25 Cup Pretzel Or Kosher Salt In a stand mixer with a dough hook, beat yeast, honey, and milk until combined. Set aside until mixture is foamy, about 10 minutes. Add butter and table salt and mix. On low speed, gradually add flour and mix until a soft ball is formed. Coat a large bowl with cooking spray and add the dough ball. Turn it around in the bowl for a complete coating of oil. Cover with plastic wrap and put in a warm place to rise, about 1-1 1/2 hours. Punch dough down, cover, and let it rest for another 30 minutes. Meanwhile, line two sheet pans with Silpat or parchment paper. Turn dough out onto a lightly-floured word surface and divide into 6 even pieces. Roll each piece into a rope about 20 inches long and arrange into a pretzel form. Preheat oven to 450 degrees. In a Dutch oven, bring 6 cups of water and baking soda to a boil. Place 2 pretzels in boiling water and cook for about 30 seconds on each side. Use a slotted spoon to transfer pretzels onto prepared sheet pans. Repeat steps with remaining pretzels. In a small bowl, beat egg and 1 teaspoon water until frothy. Brush pretzels with egg mixture evenly and sprinkle with half of Kosher salt. Bake until golden brown, about 12 minutes. Sprinkle evenly with remaining Kosher salt. Cool on wire racks and serve warm. 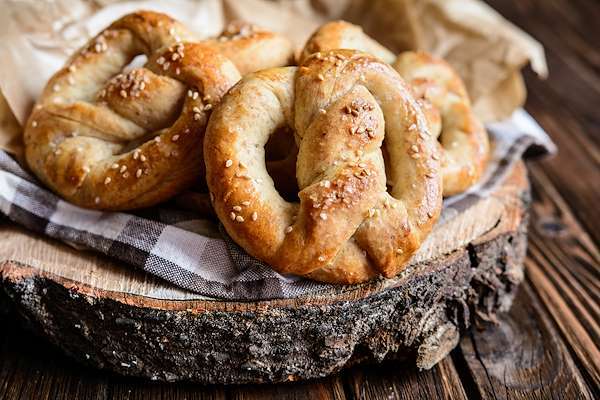 If you enjoyed this easy pretzel recipe, you'll love these fresh ideas! 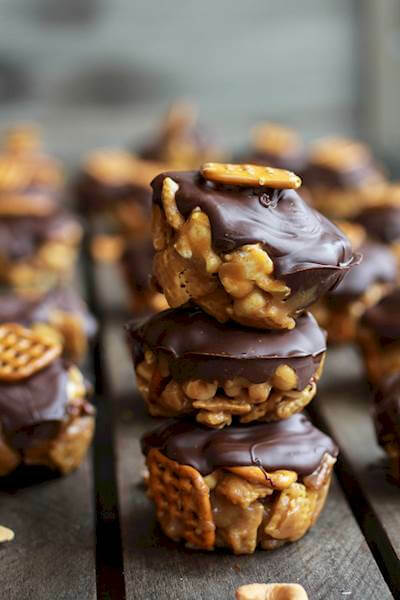 These crunchy treats are one of our great recipes for kids to help make. Just combine Chex cereal with pretzels, nuts, and popcorn before covering with a sweet mixture of peanut butter, brown sugar, and butter. Place the mixture into muffin tins and cover with melted chocolate for a crisp dessert that's ready in minutes. This twist on a traditional pretzel recipe as beer for an added depth of flavor. This can be achieved with alcoholic or non-alcoholic beer of your choosing. In under an hour you can have a snack perfect for any game night. Most military stations overseas do not have many of the snacks we do in America. 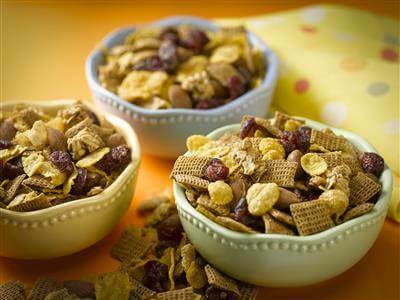 To create a classic snack mix for your soldier, let your slow cooker do the work! This mix has all the favorite ingredients, like toasted oat, rice and corn cerals, pretzels, and peanuts. Let it slowly simmer in a zesty mixture of butter, sugar, and spices, and put it in resealable bags.